mid 20’s, she traveled to Pondicherry, India to meet the famed Yogi, Sri Aurobindo. There, she became his prodigy, and she gained most of her wisdom from his teachings. Together Alfas and Aurobindo founded the Ashram, a temple dedicated to the worship towards the divine. After the Ashram, Alfas—“The Mother”—envisioned a utopia, which came to be known as Auroville. In the mid 1960’s, the people of Auroville preached about fairness and created an inclusive utopian society. The Mother accepted a pure and innocent vision bringing together many cultures. However, her “vision” became corrupt, and Auroville’s bound steadily declined with the lack of proper organization and security for its residents. From walking around the compound, I’ve noticed this shift. For myself, Auroville seems to have developed into a “disney land” or an attraction for tourism. At its main gate, tour buses line up with tourists. Introduction videos explaining Auroville and its history welcome tourists as they enter the compound. Shops are littered all throughout the main walkway to attract tourists, although tourism is limited to certain places. It felt like a tease to me; I could only see parts of Auroville, but not the whole pie. I could only view the Matrimandir, the giant globe, from a distance, and it made me curious to see what was inside. I did some research after my visit and was surprised by the some of the experiences others had while living in Auroville. One man recalled his time as a child in the article, “My bizarre Childhood in Auroville”. He claimed that he wasn’t raised adequately, and got help from other kids on the compound. He also recalled a time when he injured his arm as a child, and his mother refused to take him to the hospital, labeling him as an, “attention seeker.” This relates back to the poor organization of Auroville’s people. The town fails to effectively help their people, and it lacks the adequate medical resources for the community. In the article, “A Spiritual Utopia Struggles with Crime and Corruption”, Maddy Crowell writes on cases of Aurovillians that have been killed and raped from outside gangs. There are 32 entrances in Auroville making it hard to have adequate security. She also interviewed one Aurovillian who stated that Auroville is held together by a charter. The charter is essentially a code upheld by everyone in the community. The code is relatable to the honor code at Davidson or Furman. 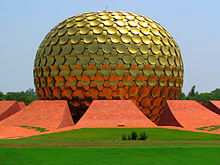 You can view the charter at the following link https://www.auroville.org/contents/1. The veteran also told Crowell that The Mother chose the people of Auroville by gazing into their eyes. A rather shallow way of selecting the occupants of such a divine and righteous utopia. There should be a background check, or interview for the selection process. Auroville was under development during the mid 1960’s. The world was largely segregated, and was at the aftermath of many years of wars. The world sought for a cultural revolution, and in turn largely influenced the movement of Auroville. However, over the course of time this movement gradually lost inertia. There is a great saying in the Tao Te Ching that says, “As soon as beauty is known by the world as beautiful, it becomes ugly. As soon as virtue is being known as something good, it becomes evil.” Auroville at one time seemed like the ideal society, but now has become a refuge for tourism.